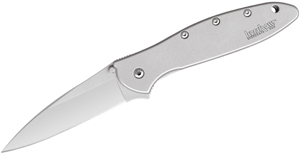 This new offering from Boker Knives is awesome. Heavily made, lockback folding knives designed by Jerry Fisk with a great shape. Better yet, Boker had them made is Asia so the pricing is incredible. Get your own Jerry Fisk designed lockback folder for under $35US! The handle feels great, the blade shape seems to be very useful with a shape that allows you to choke-up on it. The blades are full flat ground 440c stainless steel. The handles have polished liners. These are beauties. The blade grind is not quite as even as I would like, but they are an incredible deal. They are available with white bone handle or stag handle. SOG Knives is releasing some really creative items. Among them is the SWEDGE, a new combat fixed blades with the Besh wedge shaped blade tips. These tips have very different profile with a sort of chisel end for added strength. SOG is offering three different SWEDGE knife. They come with Kydex sheaths and AUS8 stainless steel blades. You can see all three at www.knifecenter.com. 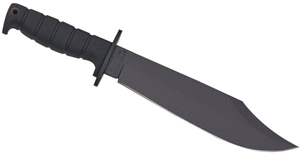 We offer a variety of knives at the Knifecenter with the Besh Wedge blade style. Buck Knives offers their Crosslock in the Boone and Crockett series. As a tribute to the Boone and Crockett Club, Buck is offering the Safety Orange Series to celebrate the principals of the famous B&C Club. This collection consists of great hunting knives from skinners to lightweight folders for any hunting pack. Each blade has the Boone and Crockettlogo etched into it, also making them collectibles. As part of Spyderco‘s limited 2010 releases, they are offering the Delica and Endura models with flat ground blades and vibrantly colored handles. These are a limited run. We have our imitial shipment in but they may fly out fast! The blades are full flat-ground VG-10 with a thinner highly refined cutting edge and a larger 13mm opening hole. Added to the blade’s spine is slip resistant jimping. 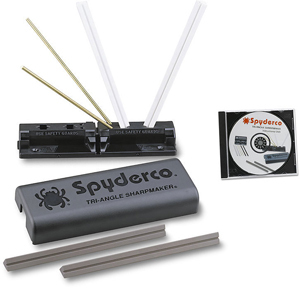 Phosphor bronze washers smooth out the open/close action and the clip is upgraded to a four-way tip-up, tip-down, left- or right-handed clip. Gerber Knives has produced one of the most significant new knives we have seen in quite some time- and that’s saying something! This LHR was designed by both Chris Reeve and Bill Harsey and they are two of the finest designers in the world today. The construction is all done in the USA. The knife has a massive blade and a comfortable handle. The sheath is specially engineered to be able to be accessed by the wearer of the knife and not an opponent that he may be in close wquarters fighting with. It’s a unique and top quality system and the price is amazing.